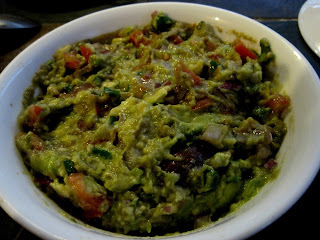 Guacamole, is a dip made from avocados,it is a mexican dish from Mexico.To prepare a perfect dish of guacamole ,ripe avocados are required,which can be tested and examined by gently pressing avocado a little outside the avocado.Guacamole is a healthy appetizer or snack. Combine all materials to gether and mash together until smooth.Finally add lime juice and salt. For extra spicy ness leave in the jalapenos seeds. Cover well and chill in the refrigerator. Avocados when deseeded turn brown /decolourised very quickly,so i placed the seed in the centre of the guacamole mixture and covered it and refrigerate it.It doesnot stay colourful for long time. Even we can serve this with tortilla chips. This one is another combo of burrito bowl..
looks healthy and absolutely inviting. very tempting it looks ... fresh and healthy.